Quesadillas are quick and easy to make, and are a marvelous vehicle for using up leftovers – the flat, flour or corn wraps reminding of a canvas on which to sketch a meal. Pound tenders flat with a mallet or can before seasoning. Layer ingredients into tortilla canvas. Oil should be hot enough to sizzle; but not too hot to burn. Last year I made a similar recipe for Spinach, Roasted Red Pepper and Goat Cheese quesadillas that is a bit more involved than this, but worth the effort. Other goodies are the Black Bean and Goat Cheese Quesadillas with Mango Salsa or the simple Mango and Goat Cheese Quesadillas, perfect for easy entertaining with a pitcher of margaritas. Long, thin chicken tenders, flattened with a mallet, are the perfect fit for tortillas. I love tortillas fried and glued together with abundant cheeses, however you could bank calories by cutting the cheese in half, baking them, and using plain Greek-styled yogurt instead of sour cream. Chopped tomatoes would have made a welcome addition to the avocado-onion salsa. Sprinkle one tablespoon lime juice over flattened tenders. Combine the cumin, salt and cayenne (1/4 t for mild seasoning; 1/2 t for spicier palates), and evenly sprinkle over chicken tenders.In a large sautÃ© pan, heat 1 tablespoon oil over medium- high heat. Cook tenders about 2 minutes per side, or until lightly seared and just cooked through. Remove chicken and reserve. Turn off heat and place spinach in hot oil to wilt just slightly. 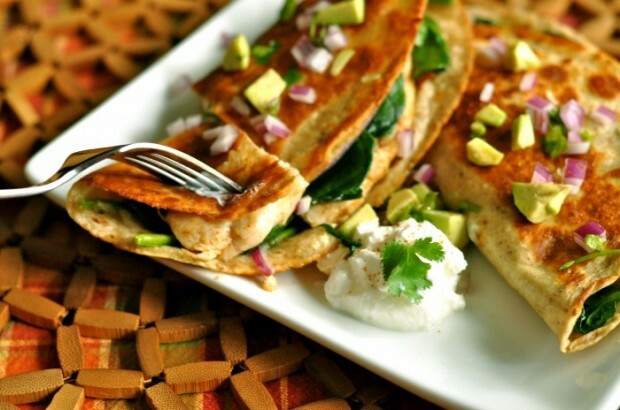 Remove and divide chicken, 1/2-1 cup cheese, spinach and sliced onion between tortillas; fold over. Meanwhile, make a salsa by combining diced avocado, diced onion, cilantro and remaining tablespoon lime juice. Drain on a paper-towel lined baking sheet. Serve with salsa and/or sour cream, if desired.